The maxim, "What gets measured gets done", is the root of many blinkered views in the business world. Only an enlightened maxim can trump this malign one. What better aphorism can you get than one from Einstein: "Not everything that can be counted counts, and not everything that counts can be counted." In real life, there are many things that cannot be measured and of those that can be measured, the brain can only keep track of only a few. Take the analogy of driving a car. Of all the various gauges on the dashboard, only two are prominent — the speedometer and tachometer. Our eyes though should not be fixated on those meters but on the road ahead and the surrounding situation. Of course we can also use the analogy of the plane with its many gauges and the need to keep our eyes on them but if there were as many planes in the sky as cars on the road, flying would've been very frightening. With the economy, we also need only a minimum of metrics. Our focus however should be on the unfolding situation which we can always glean by observing, and talking to people in business and on the street. That's why Jack Welch couldn't stomach the latest unemployment number because it doesn't jibe with the input that he's getting from other sources. The metrics for an economy are quite similar to those of a business. We've gone through the cash flow. Now it's the turn of the income statement, to be followed in the next post by the balance sheet. How do you derive an economy's income? Actually we don't need to. When you're at the micro level, that is, at the level of business, you can't see what's happening outside your business boundaries. But as you go up, that is, at the level of the national economy, you'll find that the economy is a closed system. Certainly, foreign trade exists but for most countries, the net impact — export less import — is relatively small. In a closed system, someone's income is another's expense. Or one's profit is another's loss. So there's no point in looking solely at profit as a bigger profit could mean a bigger loss elsewhere. But you hardly hear losses elsewhere because only businesses post profits or losses. 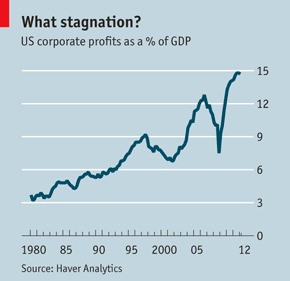 Take the profits of the US corporate businesses (see chart at left from The Economist). They continue to register ever increasing profits in the midst of a depression. But this good fortune would soon peter out once Obama runs out of deficit fire power. Well, it turns out that they are about to report pessimistic third quarter results. We can thus dispense with business income or profits since this is indicative of only one sector of the economy. For the economy, the GDP which really is the total output of the economy is the best indicator. We only need to dissect its components. For a typical country, that is, not a city-state, the relevant components are personal consumption, government spending and private domestic investment. The exports and imports, although each may be sizeable, are small when offset against each other. For example, the imports less exports of the US over the years tend to range between 3 and 6 percent of GDP. If the number sways beyond this range, the drop in exchange rate will set it back. The problem with the southern euro countries is that, with no possibility of currency devaluation, they have straitjacketed themselves into a progressively worsening situation with no avenue of redress. The chart at left shows the three main components of the GDP in real terms using 2005 dollars. I've used two vertical axes because personal consumption is several times the size of the other components, this being the result of a quirk in categorisation. By using two axes, we can place the three components close together and magnify their movements. Though both axes start at different amounts, their vertical increments are identical. I've also chosen 2001 as the beginning year since this is the beginning of the depression in the US with the dotcom bubble burst. With this magnification, we can see clear patterns. The steep increases in both debt-financed personal consumption and investment prior to the subprime crisis were never sustainable. This led to the crash in 2009. Government spending took up the slack in 2009 but it has been on a gentle decline since 2010. Investment, of which only a quarter is undertaken by households on residential properties, the rest by businesses, appears to have stalled in 2012. Only personal consumption by households still mindlessly climbs upwards. But households eventually depend on income from government spending and business spending to drive personal consumption spending. Now, the quirk in GDP computation that I mentioned earlier is the non-inclusion of business non-investment spending, the bulk of which is on payroll, for reasons of double counting. But similar spending by the government is included. That's why the GDP component spending is disproportionately skewed towards personal consumption. Be that as it is, we can infer from the investment spending, three quarters of which is by businesses, the pattern of business non-investment spending since both would have moved more or less in a similar fashion. As investment is now stalling, shouldn't non-investment spending also flag? The third quarter results of major US corporations which are expected to be subdued portend dark clouds on the horizon for business non-investment spending and, by extension, household income. The relative size of the GDP components for the US economy is typical of most other mature economies. Developing economies however have a different component profile. Their investment spending is proportionately much higher. The US investment spending as a percentage of the GDP is usually in the teens. Not so for China. I've included two pertinent graphics, the first from The Economist and the other its sister publication, The Financial Times, to demonstrate how insanely weird is China's economy. This concerns its investment spending. Never in the history of mankind has economic growth been powered primarily by investment spending that's now touching 50 percent of GDP. China is fuelling its growth by adding more capacity. In the early days of the Kondratieff Wave, this may have been acceptable though still excessive. But we are in its waning days in which capacity would be least needed. If this were a car tachometer, China is in the redline zone with the engine about to seize. It would've been safer for China to heed Keynes's advice that the government should instead pay people to dig holes in the ground and then fill them up. At least there won't be deserted apartments and malls, and underutilised roads and railway tracks that would've been costly to maintain or demolish. 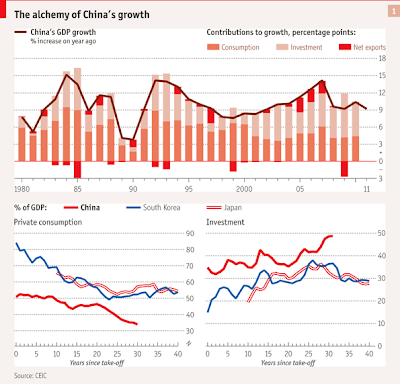 China's relentless drive for growth at all costs is the price being paid for the mistake that Deng Xiaoping made more than 30 years ago. In an interview then, Deng was asked whether wealth accumulation contradicted socialism's doctrine. Deng assured the interviewer that China's wealth accumulation was unique because its wealth would be shared by all. Deng might have been politically astute but economically he was a neophyte. Once you allow wealth accumulation, you must be prepared to live with extreme inequality. Probably only the Scandinavians have found a way to equalise wealth with massive government transfers. Mao Zedong was thought to have been a madman for carrying out the bloody purges of the Cultural Revolution. But let us reflect on the wise words of Kenneth Boulding, an American economist who was cofounder of the General Systems Theory: "Anyone who believes exponential growth can go on forever in a finite world is either a madman or an economist." Now, Mao doesn't seem that mad after all.